The Stamps’ evened the Turnbull Cup Series with a dominating 7-2 win on home ice Saturday [April 13, 2019] night in front of a sold out crowd. Matt Osadick and Campbell Balk score twice to lead the way, while Merek Pipes stopped 32/34 for the win in net. Swan River, MB native and recently crowned MJHL player of the year Josh Tripp, opened the scoring sliding home his 11th of the post season at 8:04 of the first period. Matt Osadick would score his first of the night after a shot rang off the post and he cleaned up the rebound just over eight minutes later. 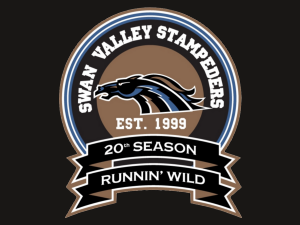 The Stampeders power play came to life early in the second as Swan Valley would score three consecutive goals on the man advantage. Bradly Goethals would score 3:25 in, sending a perfectly placed shot on net that beat Ethan Peterson over the blocker on the power play. Matt Osadick would bang home a loose puck a minute nine later on the power play. Campbell Balk picked up his second of the post season as he let a shot got that beat Peterson on the power play just over a minute later. Captain Brian Harris would grab a loose puck, turn, fire and score over two minutes later. Portage would score two goals three minutes apart late in the second period but the damage was already done. The scoring dried up in the third period as both teams tightened up their defensive play. Swan would skate to a dominating 7-2 win on home ice Saturday night. Final shots on goal 34-24 in favour of Portage. With the win on home ice the Stamps’ have now evened the Turnbull Cup series 2-2, with game 5 taking place in Portage Tuesday April 16th. Puck drop is slated for 7:30pm. Tickets are available online for anyone wishing to travel to Portage.